When people ask me what I do, I tell them I’m in the business of helping people make money. The business we’re really in though, is helping improve the lives of our clients. It comes from the belief that life is about more than money. I believe money is an enabler – it provides us with options, choice, and flexibility. So if we can help our clients preserve and build their financial wealth, we can help them live a more meaningful and fulfilled life – a life that is truly rich. Sadly, most people never achieve a life that is truly meaningful and fulfilling – true wealth. Why? Because they’re focused on the scoreboard, and not the process. They’re focused on chasing the money. Enter the world of investments, stock brokers, financial advisers, fund managers, and high flying financial institutions. If you’re not careful, you might be sailing toward financial freedom with a hole in the bottom of your boat. That hole, is in fact lining the pockets of those purporting to be helping you sail toward the sunset. When was the last time you looked at your superannuation or investment portfolio statement? Your portfolio has probably grown, especially over the last ten years, so you haven’t taken too much notice. The real question is, how much have you left on the table? Australians have around $2 trillion sitting in superannuation, which has attracted fund managers like bees around a honey pot. And Australian are paying some of the highest fees for the management and oversight of this money. In fact, last year, Australian’s paid $31 billion in superannuation fees – totaling around $230 billion in the last decade. This covers marketing and distribution cost, as well as the management of the portfolio. Typically, this is the only fee investors are aware of. Typically investment managers buy and sell frequently. And with these transactions comes transaction fees. There are three types of transaction costs: 1) brokerage, 2) market impact, and 3) spread. This is the portion of your portfolio that is invested in cash. It hurts your return over the long-term because of the missed opportunities in the market. When you by into a fund, sometimes you’re being taxed for other investors’ gains. The total of these fees can be as high as 4.17% pa. Although on face value these fees don’t seem high at all, when you compound these costs over long periods of time, it will blow your mind. The above list didn’t even include performance fees! You put up 100% of the capital, you took 100% of the risk, and you got 33% of the return! Forget fees. Just invest in the top performing funds, or sell before the market falls and buy before the market rises (market timing). Easier said that done. Over the last 15 years, almost 80% of all Australian fund managers have failed to beat the broad Australian share index. And after 15 years, only 56% of Australian find managers survived. Over the last 15 years, almost 90% of all international fund managers failed to beat the broad international share index. And after 15 years, only 46% of international fund managers survived. Researchers Richard Bauer and Julie Dahlquist examined more than a million market-timing sequences from 1926 to 1999. Their research concluded that by just holding the broad market index outperformed more than 80% of market-timing strategies. Clearly, neither of these strategies put the odds firmly in your favour. In fact, they’re akin to gambling more than anything. Making money in the markets is tough. So if you can’t beat the market by hiring the best, what to the the real experts recommend you do? If you are ready to give up everything else and study the whole industry and background of the market and all principal companies whose stocks are on the board as carefully as a medical student studies anatomy – if you can do all that and in addition you have the cool nerves of a gambler, the sixth sense of a clairvoyant and the courage of a lion, you have a ghost of a chance. If you pack 1,024 gorillas in a gymnasium and teach them each to flip a coin, one of them will flip heads ten times in a row. Most would call that luck, but when it happens in the fund business, we call him a genius! He even made a bet in 2008 and put his money where his mouth was. You can read my note about it here. It’s super important to know that not all costs are bad. The right financial adviser can help you make better decisions over the long-term to save you money. Vanguard recently published a study to help quantify the value of a good adviser. This does not include any other benefits or value of a good financial adviser, such as strategic and structural advice. Compound that and see what your portfolio looks like. Next time you pick up your investment portfolio statement, think twice about what you’re doing. Are you 100% sure the financial odds are firmly in your favour? Fees are the silent killer in your portfolio, and only a handful of funds beat the market consistently and over the long-term, and much of this can be attributed to randomness. Being in the market, while minimising costs, can empower you to getting the real financial freedom you deserve. I commend him for his honesty – well done. And it’s true. Clearance rates have been falling sharply since mid 2017 (see below chart). Clearance rates have dropped from a solid 80% to about ~46% (final) in Sydney, and ~49% (final) in Melbourne. The last time we saw these levels were back during the GFC and 2012 (when interest rates were first cut). Allow me to give you insight as to the implications (at least historically) of falling clearance rates. They’re a leading indicator for house prices by about 5 months (see chart below). As auction clearance rates fall, we see property prices fall in the following months. Not only are clearance rates a leading indicator, so too are housing finance commitments (loans). These have also been falling (see chart below). Loan commitments are a leading indicator by about the same time as clearance rates – 6 months. As the regulators and banks tighten lending standards, as we continue to see a rise in the supply of dwellings, as affordability is still an issue given low wage growth, and with the constant drumming of political and policy uncertainty (negative gearing and CGT discount), we can expect further weakness ahead. As I began to write this note, I found out that 60 Minutes was airing ‘Bricks and Slaughter’ at 8:30 pm (click here for the ‘Part One’ episode). The episode was basically calling for a housing crash. Martin North of Digital Finance Analytics predicts a housing crash of 40%-45% within the next 12 months, and we hear Louis Christopher of SQM Research echoing Mr North’s call. Anyway, I think I have said what I wanted to say here. It was largely the @DFA_Analyst show afterall! 45% down the next 12 months?! Ok, over to you, Martin! Well done 60 Minutes in fear-mongering the Australian public. To this day, we continue to hear comparisons being made to the US property bubble. What most people don’t understand is that the “housing market” is made up many other smaller ‘markets’. To illustrate this point, take a look at the table below. It shows the top 10 US cities’ boom from 1996-2006, crash from 2006-2011, and so on. Take a look at New York, up 173% during the boom, and down 24.45% during the bust. Dallas was down 7.53%, and Boston down 16.38%. The interesting thing about all of this is that the city with this largest gain (LA) was not the city with the largest fall – it was Phoenix, down almost 55%! On average, the US housing market fell 33%. One fact that I don’t believe gets enough showtime is the oversupply of dwellings in the US pre GFC. Leading up to the GFC, the US had overbuild close to 6,000,000 units of housing. As of the beginning of 2018, the US is sitting close to 2,000,000 units short (see below chart). In Australia, we have a very different story (see below chart). For many years, we have never truly caught up to the demand for dwellings. Having said this though, we are getting to a point where we are now seeing good supply hit the market. The Australian, specifically Melbourne and Sydney property market has been running hot for a number of years now. We will see a collapse in prices – timing and magnitude, no one truly knows. However all indicators are pointing to a slow down and natural correction. The fundamentals for property in this country remain strong, yet the sentiment remains weak. The market will present buying opportunities for those that are patient, disciplined, have a game plan and are cashed up. As foolish as one may feel for holding funds in low returning cash and term deposits, the tide will turn, and you too will have your opportunity. What needs to be done, and what would I like to do – Mowing the lawn, washing the car, or taking the kids to the park? What’s really important – time with my kids. Can I outsource the rest – yes. For me, my family and kids are the most important thing in my life (after my health, because without it I can’t enjoy and provide for my family). More often than not I find that I somehow convince myself that I’ll get around to doing the other two things, such as mowing the lawn and washing the car because this time it’s different! Time and time again however, the grass gets longer, and the car get’s dirtier. Without exception, I give in. I’ll arrange for Victor the lawn guy to come over and do the lawn, and the car will be dropped off at the car wash whilst we’re at Westfield Shoppingtown. Inevitably, the cost of mowing the lawn and cleaning the car is always more expensive because I left it for so long and it got so bad. No brownie points even though I had good intentions. Our time is so valuable, yet I think many of us don’t realise this. Realise it not intellectually, because I think most people understand the concept of finite time, but understand it emotionally. I will be willing to bet that not one of you, if you were offered every dollar of his (Warren Buffett’s) fortune would trade places with him right now. And you would all intuitively say no, I think, because you realise that time matters more than money. And I would also bet by the way, that he would be willing to be 20 years old again if he was broke. The question Attia asks is incredibly thought provoking. Sure, I could have all the money and fame in the world. I could travel to anywhere I like, I could meet anyone I wanted to meet, and I could buy anything I wanted to have. Notwithstanding Warren Buffett’s fortune, there is no way I would be willing to trade places with him – would you? In our everyday lives we outsource and spend money on so many time-saving purchases. From Friday night take-away, buying fruit and veggies from the market, to having our cars serviced. Not only do these purchases save us time, some of them require more skill and expertise than others – and we’re happy to pay a premium for it. In the world of money management, the amount of time, focus, attention, and expertise that is required is enormous. Not only are the above factors required, the most underrated factor, I believe, that is required is having the ability to control human emotions. Trade money for anything that is below your hourly wage. Trade money for anything that allows you to spend more time on things you find more meaningful and fulfilling. Trade money for anything you’re not an expert at – you’re likely to have no idea what and how to do it, if you do know how, you’re likely to take twice as long, make a mistake, or not optimise the outcome. Never discount the concept of time and how a precious commodity it is. You’d be totally forgiven for thinking no more of what a bad economy and market looks and feels like. I mean, how could you not? World stock markets continue to make all time highs. The current bull market (as defined as a 20%+ increase in the market) has lasted 3,255 days, which in fact is the second longest on record behind the 4,494 day bull market that ran from late 1987 through to the early 2000. The market climbed 13 years without a single decline of 20% or more. 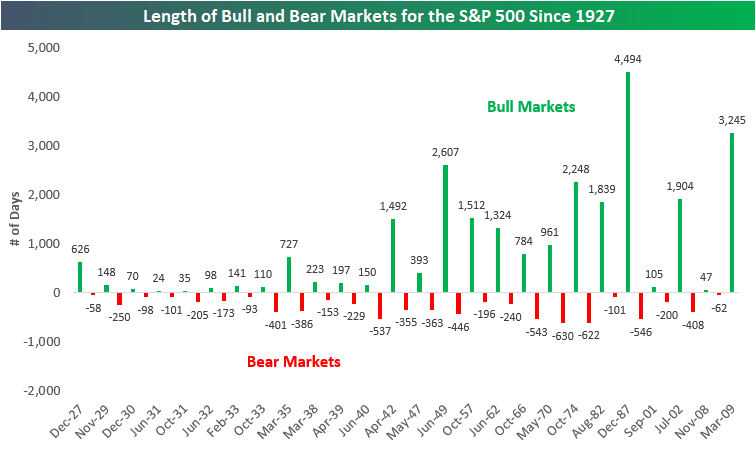 If this bull market was going to topple the record of the 1987 bull market, we’d see our stock market continue to climb until the 19th of June 2021. Hard to imagine right? It’s not as if it hasn’t happened before! Here’s a chart of both bull and bear markets since 1926. It shows the number of days both bull and bear markets have lasted. 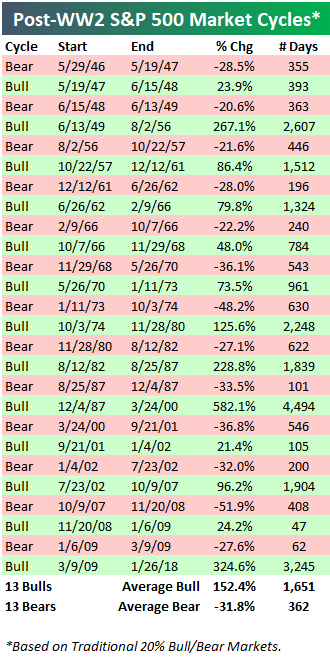 A couple of things to note: 1) Bull markets last longer than bear markets (I mean, a lot longer!) – the average bull market has lasted 981 days, and the average bear market has lasted 296 days, and 2) Bull/bear market cycles have been lasting longer since WW2. Let’s dig a little deeper into the post WW2 period. The chart below shows all the bull (in green) and bear (in red) markets, when they started, ended, the percentage change, and number of days they lasted. The average bull market was up 152.4% and lasted 1,651 days, with the average bear market falling 31.8% and lasting 362 days. Market All Time Highs (ATH) doesn’t necessarily mean the market will crash. Here are the number of ATHs each year since 1929. The year 1995 set the record with 77 ATHs, 1964 recording 65, and 2017 notching up 62. The year 2017 is sitting in third place with the number of ATHs in any given year. Presently, the year 2018 is in 27th place, with four months to go in the year – anything could happen. No one knows how long this market will continue to run hot. No one knows when the market will collapse either. What you can and should do however, is design your portfolio as if the market will collapse tomorrow. Because someday, maybe sooner rather than later, the market will collapse tomorrow. And you will exhibit precisely the same behaviour as you did in 2008. You will have forgotten how you behaved, however you will remember exactly how it felt. Your human mind will switch to ‘fight-or-flight’ mode, and you will either destroy a lifetime of savings, or you could create a lifetime of savings – the choice is yours. As long as the music keeps playing, we’ll all continue to dance, until it stops.